THE NEW 2000 SEASON WILL BEGIN SOON! For updates throughout the season go to Navy Sports. 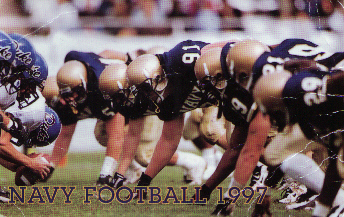 Navy football is the coolest and so is the Navy! This is my tribute page to Navy. Right now I don't have much on it, but I will soon so keep checking back. Oh yea, while I'm talking about Navy- I gotta give some credit to Army, Air Force, Marines, & Coast Guard- you people cool too (just not as much).